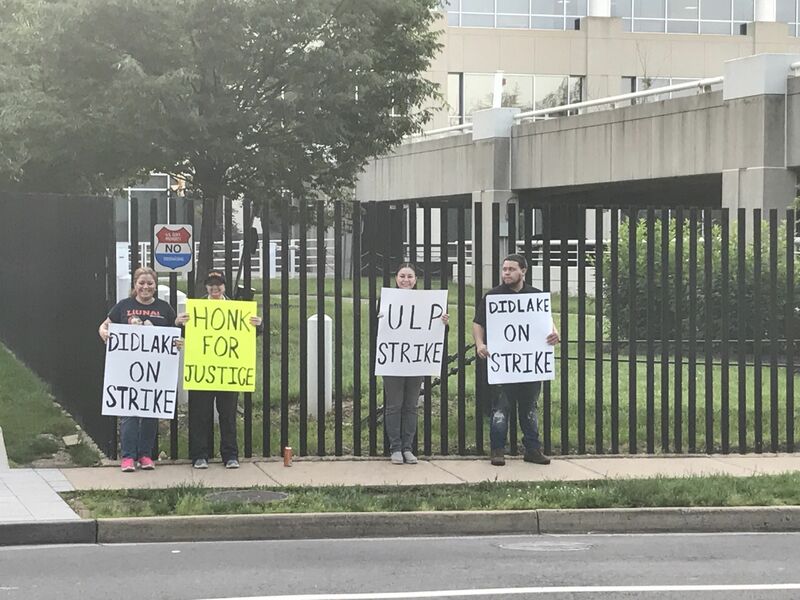 Arlington, Va. (May 25, 2018) -- Today, Didlake Inc. employees called a strike on their employer over continued violation of their worker rights. Didlake employees who clean the buildings at the Arlington National Guard made numerous attempts to come to an agreement with the company over various issues with the help of LIUNA Mid-Atlantic Regional Organizing Coalition (MAROC). Each time the employees were met with stubborn opposition and rejection, which has now led them to strike. Over a year ago, a group of disabled and non-disabled Didlake workers voted to unionize in order to find a solution to their workplace issues. The company disregarded the vote. “All these employees want to do is use their legal right to organize so they can improve their pay and health care plans,” said Xiomara Vasquez, MAROC Organizer. Out of further disrespect to its workers, the company claimed its disabled workers, the ones for which Didlake advocates so strongly, have no right to join a union and have no place participating in collective bargaining. “For a company who claims it helps disabled people lead a better life, Didlake is doing everything possible to make its employees’ lives difficult,” said MAROC Director, Steve Lanning. Since April 2018, MAROC and Didlake employees have educated National Guard staff through leaflets that explain the situation. The leaflets included Didlake CEO Donna Hollis’ contact information in the hopes that she would intervene if she received enough calls in support of Didlake workers. “This strike is a result of Didlake’s failure to address its employees in their smaller actions, and will end once Didlake honors and respects their employees’ rights,” said Lanning.